What does an effective quarterly meeting look like? 4) Plan your next successful quarter. If we achieve these four objectives, it will be a very successful day (or more) spent together. 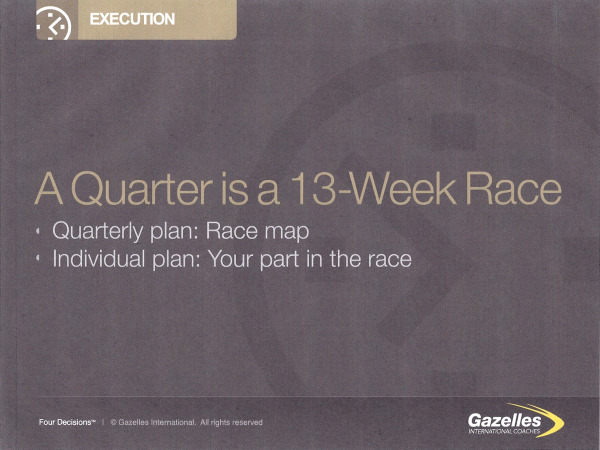 What should be included, and what does an effective Quarterly Planning Agenda look like? 10 - 30 Minutes - Top Victories - Share your personal top Victory or Accomplishment. Everyone shares their progress on the specific priorities their department is making for the quarter and year. What kind of impact is this having on the company? What challenges are you experiencing and where are you making headway? Each leader should share three victories from their department. Then brag about 2 other people in the group that you know have made progress. Let others know what they’ve done and how it is impacting the team and the company. 1) Discuss how the company’s core purpose motivates - do we use this tool? And if not, how may we use it? 30 Minutes + Review Previous Quarters [Metrics/Goals] - Review the quarterly numbers and progress on your quarterly dashboards. Discuss the results those who are accountable are achieving and if not why not. If not, dig and help them discover ways to reach their numbers. Discover what worked – Use Appreciative Inquiry. Make adjustments where necessary. What lessons were learned? Stop measuring where there are no key actions. 30 Minutes - Review Meeting Rhythms - What’s working what should be improved? 15-30 Minutes - Team Assessment Exercise Performance Matrix - This exercise is to get you to identify and keep your A Players, get rid of, or reassign any C Players (reduce cost NOW) and coach your B Players hard to get productivity up. Put your people in their places of strength. If a C player is capable of producing in another function of your business, find a place for them provided they can perform at a B level or above. If you need to hire – then select ONLY A Players. Each leadership team should grade their team members on the Performance Matrix Quandrants. 1 Hour What did we learn? What can we work on? 1-3+ Hours - Plan next Quarter – Review Annual Plan. What should be the focus for this quarter? Develop Theme or sub theme. Determine Company Priorities and Individual Priorities. Develop top three priorities for quarter. 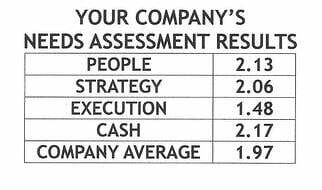 Company Plan – What’s your KPI’s? Your Priorities? What’s your company's number one thing? 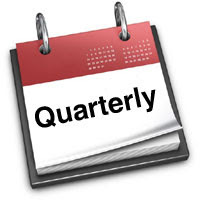 Quarterly Individual Plan – What’s your KPI’s, Quarterly Priorities and you #1 Thing for the Quarter? 1 Hour - Quarterly Action Plans – Who, What, When, Resources Required. What are the Rocks and Priorities and the deadlines to meet them? 20 -30 Minutes - Summarize and Commit. Review and Discuss all priorities. Make sure nothing has been missed and every priority has some one accountable. Everyone on team commits to meeting objectives. One Phrase Closes - Everyone delivers a word or phrase about how they feel about the meeting. The times suggested here in the left hand column are just that – suggestions. Some company’s plan two days for a quarterly meeting, others simply plan four hours. How much do you want and need to get accomplished? How many people will be attending and how aggressive are your targets? Your judgment might be on how long you’re team’s been doing this, or more importantly how dynamic your market is. Keep a Log - Record who said they would do what, when. When’s your next quarterly meeting going to be? Who is going to attend? If at all possible schedule the meeting off-site to ensure high concentration and reduce distractions. Have your team input their responses to the meeting agenda items prior to the meeting using a tool like Google docs. It helps get the thinking and planning process started and also assures everyone comes to the meeting prepared. It should reduce the time of the meeting. One more recommendation: Plan to take breaks every 90 minutes as prescribed by the Power of Full Engagement. It’s considered the maximum time for holding attention. If you’d like a copy of this Quarterly Planning Meeting send me an email with Quarterly Planning in the subject line and I send you it. Want to learn more about how to create a quarterly and annual plan to focus your business on growth? Download the Mastering the Rockefeller Habits Four Decision Workshop flyer. Register to attend this event November 12th in Cedar Rapids.